Former U.S. 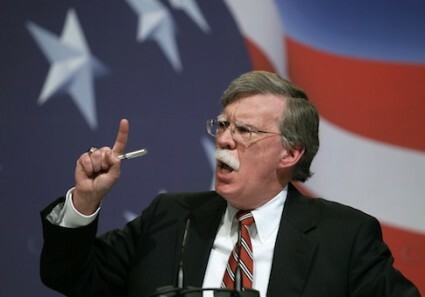 Ambassador to the United Nations John Bolton is backing a rising generation of House Republican national security hawks who are facing primary races in 2016, his political action committee told the Washington Free Beacon on Wednesday. Bolton’s PAC has endorsed Republican Reps. Elise Stefanik (N.Y.), John Katko (N.Y.) and Martha McSally (Ariz.), who each joined the House of Representatives at the beginning of the year. Bolton will also back Rep. Tom Reed (N.Y.), who was elected to that seat in 2013. "These representatives are committed to ensuring that strong American foreign policy is at the forefront of the Republican Party and Congress," Bolton said in a statement. "It is a priority of mine to ensure they win their primary and general elections so they can continue to provide leadership in Washington on issues surrounding national security." Stefanik, who at age 30 is the youngest woman to be elected to Congress, has been a staunch critic of President Obama’s policies on Iran and Cuba, blasting him for "prioritiz[ing] our relationships with our adversaries over our allies." Reed has strongly opposed New York’s fracking ban, describing it as a national security issue and arguing that loosening restrictions could reduce U.S. dependency on foreign oil. Katko previously worked for the Department of Justice and was tapped earlier this year to lead the House Homeland Security Committee’s new task force to combat Islamic State terror recruitment. McSally, a former Air Force colonel and member of the House Armed Services Committee, has aggressively fought to save America’s fleet of A-10 Warthogs. The Warthog was a 2014 Washington Free Beacon Man of the Year honoree. Bolton’s PAC contributed $5,000 to each campaign. He previously announced his support for three other Republican primary candidates in March. "It’s part of what I think will be a long-term effort to get national security back in the center of the overall political debate," Bolton told the Free Beacon in March. "The more people who are elected who understand you have to be able to defend the country before you can turn to more traditionally domestic issues, that simply moves the weight of the whole debate."